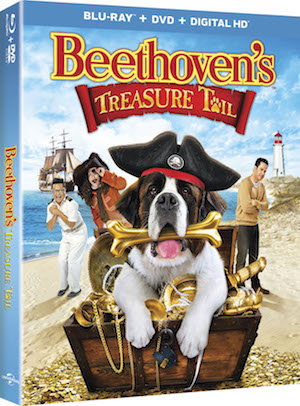 Beethoven and his trainer Eddie end up in O'Malley's Cove where they meet a young boy and his mother. The boy has a dream to find the treasure his father told him about before he passed away. What I love most about this movie is how Beethoven says so much without uttering a single word. His face shows such emotion. I enjoyed the moments of Beethoven and Sam as they ventured out together. Beethoven either passing gas in Sam's face or saving his life. I'd say that makes for some laughs. Kids will appreciate the little Indiana Jones type moments as Sam heads into a spider web filled cave and ends up with a large spider on him. Morgan Fairchild makes an appearance as Eddie and Beethoven's manager Charlene. The moral of this story is never give up your dreams and you never know where you will meet your next best friend.